Fred Evans was a talented comedian whose 200 or so films were immensely popular before and during the First World War. Unlike his childhood friend Charles Chaplin , Fred , with the able support of his brother Joe , relied less on observational comedy, but drew more heavily on theatrical burlesque. Deriving from the world of Victorian entertainment, their films abounded with punning intertitles and the relentless substitution of ludicrous for dramatic themes. 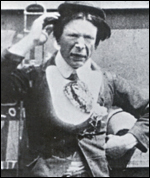 As the anarchic Pimple, Fred rivalled Chaplin 's early popularity in Britain, but changing circumstances were to leave him, and Joe , to pursue less exalted careers. Joe scripted the films and provided jokey intertitles, while Fred acted as director. Fred and Joe 's grandfather was a popular clown, while their uncle Will Evans was a leading comedian and founder of the Sunny South film company. Following a circus apprenticeship Fred and Joe performed with their parents in a pantomime act, the Florador Quartet. Joining Cricks and Martin in 1910, Fred 's early screen appearances were as Charlie Smiler, a disaster prone 'dude'. When his uncles, the music-hall performers Seth and Albert Jee , combined with Will Kellino to launch Ec-Ko in 1912, Fred began to appear as Pimple, a clown-like character with tight clothes and lank strands of hair framing a whitened face. By 1913, Fred and Joe had moved to Folly Films where their knockabout comedies began to be replaced by send-ups of films, plays and novels. The humour of Pimple films derived from theatrical burlesque, music-hall satire and from a tradition of buffoonery that embraced such infantilised characters as Silly Billy. The more sensational an original production, the more their power of ridicule was engaged. Pimple's Battle of Waterloo (1913) set the pattern for many farcical pastiches, mercilessly satirising an early film epic The Battle of Waterloo (d. C. Weston, 1913). In Pimple in The Whip (1917) a famous melodrama inspired them to re-enact its thrilling race scene with pantomime horses. A series of Lieutenant Pimple films poked fun at the screen exploits of the swashbuckling Lieutenant Daring (1911-13). In keeping with such broad caricature, Pimple was liable to extreme character change, appearing equally as a criminal or a law-enforcer. Occasionally, Pimple would be portrayed as a woman or a child. In private life Fred resembled Pimple, skilfully evading a succession of creditors until bankruptcy caught up with him in 1920. A period in which he provided an army recruiting entertainment ended with a medical discharge in 1916 and coincided with the decline of his film career. Fred and Joe abandoned filmmaking and returned to the music-hall stage. Joe toured the United States; Fred appeared in revues with his wife and two daughters. The brothers reunited during the Second World War to present a puppet show and, after Fred died working in a circus, Joe continued to appear in a concert party.